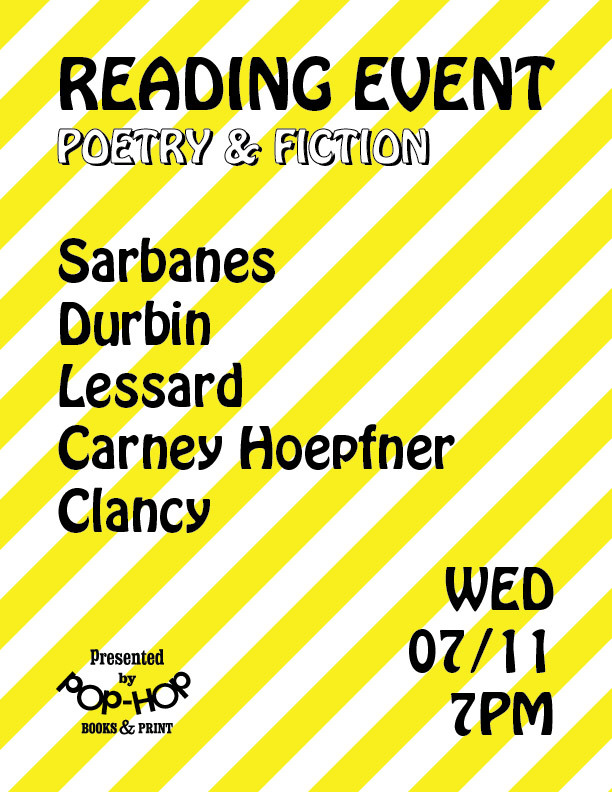 Please join us for a special evening of poetry and fiction with LA and NY writers whose work has featured in The New York Times, BOMB, NPR, McSweeney's, Glass Poetry, and Art in America. Janet Sarbanes is the author of the short story collections Army of One and The Protester Has Been Released. Recent short fiction appears in Black Clock, P-Queue, Entropy and North Dakota Quarterly. A 2017 recipient of the Creative Capital/Andy Warhol art writer’s grant, Sarbanes has published art criticism and other critical writing in museum catalogues, anthologies, and journals such as East of Borneo, Afterall, Journal of Utopian Studies and the Los Angeles Review of Books. She lives in Los Angeles and teaches in the MFA Creative Writing Program and the MA in Aesthetics and Politics at CalArts. Kate Durbin is a Los Angeles-based artist and writer. Her books include the forthcoming HOARDERS (Gramma), E! Entertainment (Wonder), The Ravenous Audience (Akashic Books), and the collaboration ABRA (1913 Press). ABRA is also a free, interactive iOS app that is "a living text," which won the 2017 Turn On Literature Prize for electronic literature. Kate's work has been featured in The New York Times, Art in America, Art Forum, XO Jane, Nylon, Casa Vogue, Yale's American Scholar, NPR, The Creator's Project, Public Art Dialogue, ArtSlant, Poets and Writers, DAZED, BOMB, poets.org, The American Poetry Review, Flavorwire, Best American Experimental Writing, PennSound, The Pulitzer Foundation and elsewhere. Currently, she is a Visiting Professor in the English Department at Whittier College. William Lessard is a writer and critic based in New York. His writing has appeared in McSweeney’s, Brooklyn Rail, Hyperallergic, Prelude, PANK, and Heavy Feather Review. His visual work has been featured at MoMA PS 1. With Mary Boo Anderson, he is editing an anthology of Brooklyn poetry for Dostoevsky Wannabe. Kolleen Carney Hoepfner's poetry and other writings can be found in Five 2 One Magazine, Golden Walkman, Bad Pony, Rabid Oak, Birth.Movies.Death, Occulum, Glass Poetry, Moonchild Magazine, Memoir Mixtapes, and elsewhere. She has an MFA in poetry which, I mean, come on. Kolleen serves as Editor in Chief of Drunk Monkeys, and is the Managing Editor and Social Media Coordinator for Zoetic Press. She lives in Burbank, California, with her husband and son. All she does is eat pasta, drink vodka, and watch Vanderpump Rules. She tweets @KolleenCarney, and blogs…poorly… at kolleencarney.com. As a last-minute surprise, there will be a special warm-up set by Leah Clancy. Clancy is a poet and visual artist, a native Buffalonian, a redhead, a Los Angeles transplant, a cofounding editor of Potluck Mag and future poet laureate of your heart. You can find her work in Peach Mag, Funhouse Mag, Gesture, and more, but mainly it's in a folder of her Google Drive uniquely titled "Creative Writing".